At Get Cracking Removals we have great rates for Student Storage in Dublin. Student storage is designed to offer students much better storage prices. We do require valid student identification, its important to be aware of this. We understand that not everyone will have the same volume of household goods, so we have specifically designed storage units in Dublin to meet the needs of our busy student community here in Dublin. So if you only need to store half a dozen boxes, we have the correct storage units and most importantly, we have the correct storage rates for you too! If you fill out this get a quote form, we will respond to you with in 24 hours with an exact price for your storage. Our storage rates for STUDENTS… are as low as €15 per week!! We can even arrange collection of your belongings, so you don’t really need to do a thing, our collection fees for students are also lower than our normal rates. Our storage facility in Dublin is safe and secure, it is also temperature controlled in order to keep your belongings in the best condition possible. If you wish to stop by, please contact us to make an appointment. Please call us on 087-2337206 or 01-5513270 for the best rates. Get Cracking Removals offer a reliable removals service in Dublin and across the country. Our removal trucks are large enough to hold the contents of a four bed house, so if your moving from Dublin to Cork, there will not be a need of a second trip! We can also offer very competitive removals prices, as we normally have a load to collect on the return trip. If you happen to be moving from the country side to Dublin city, its possible for us to deliver moving boxes to your door step, we can also supply packing materials such as bubble wrap, packing tape, labels, etc…what ever you might need to help get your belongings packed up and ready to go! Some removal companies in Dublin will not quote for long distance moves, however we are happy to quote. In some cases we can provide an on site survey, if not we may ask you for a list of items and a rough number of moving boxes. Either way, we will aim to provide the best possible removal quote, along with a great removals service. Call us for a quote on 01-5513270. Take a look at our removals to France blog post. Do you need to hire crates, for an office move or a house move in Dublin ? We can hire moving crates to anywhere in Dublin or across the country, we can deliver moving crates to your door, with just a few hours of notice for a very reasonable rate. Moving crates can be used for both office moves and house moves, they are very strong when compared to regular cardboard moving boxes. Our moving crates come each come with their own label, to help you keep track of the contents of each crate, making your house or office move more organised. We hire moving crates to all areas in Dublin, for areas outside Dublin, we may have an additional delivery fee depending on the location, we try to keep delivery fees as low as possible, which saves you money. Get Cracking Removals supply larger PC Crates, Personal Crates and Standard Moving Crates. We can also supply a wide range of packing material such as bubble wrap, shrink wrap, packing tape, wrapping paper, labels, etc. 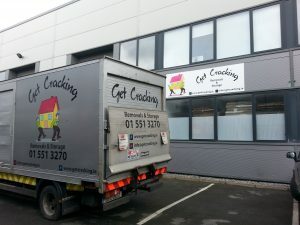 Please contact us for a delivery price, info@getcracking.ie or 01-5513270.